“So, how was Tivoli Fest in Elk Horn, Iowa,” you ask? OK. Good. Awful. Hard to say. I rolled into Elk Horn on Friday afternoon, having taken a vacation day. 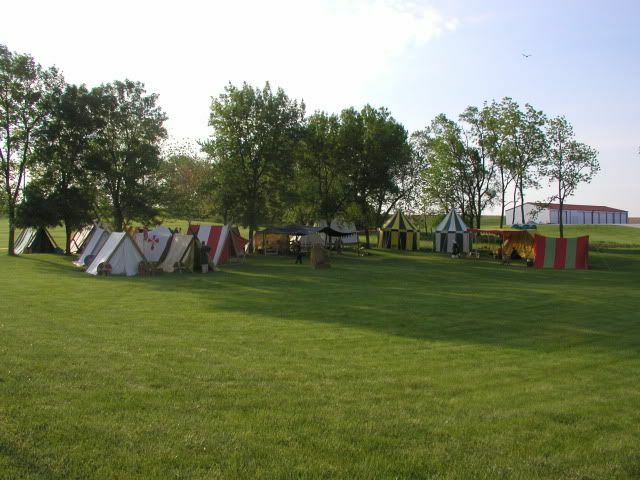 An extensive Viking camp had been pitched in the camp area, across the street from the Danish Windmill and Viking House. Almost immediately when I arrived, a guy I knew fairly well started ragging me about Christianity, asking for my support for the contention that a main purpose of the Inquisition had been to keep women in their place. Now, I don’t think he meant it maliciously. Essentially he was joshing me. In fact, I should be flattered by the fact that he assumed I was sane, and had mistaken me for a person with a healthy ego, who could safely be joshed with. The weekend kind of went downhill from there, at least in my brain. I slept in a borrowed Viking tent (kindly brought down by other members of our Minneapolis group). My inflatable mattress turned out to have a leak, but I still got some sleep, thanks to the previous night’s insomnia. The next day was highlighted by one good battle session—three fights with the largest group I’ve ever participated with. About ten people (there was a woman, an archer) on either side. Fun. I enjoyed it very much. My acquaintance ragged me about Christianity again at some. I forget the exact details. It rained in the afternoon, which kind of spoiled the rest of the day. We ran around a lot, trying to get stuff under cover. One guy’s tent broke in the wind. 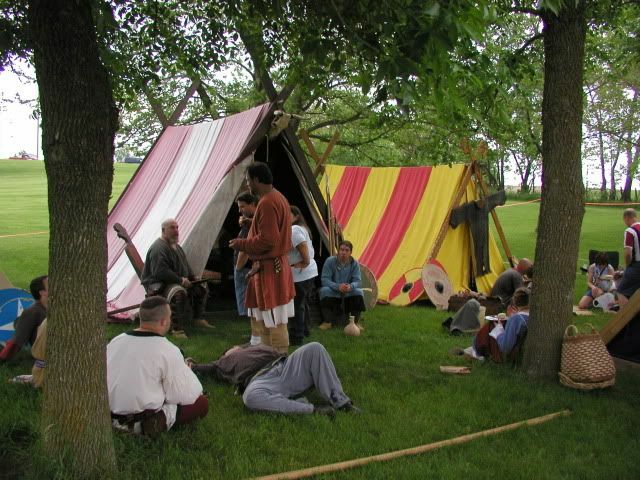 Some of the people changed out of their wet Viking clothes into modern clothes, and there was no more fighting. On the last day (Sunday), there was some fighting, but by that time I felt so insecure I didn’t join in. The thing was, the battle just sort of coalesced. 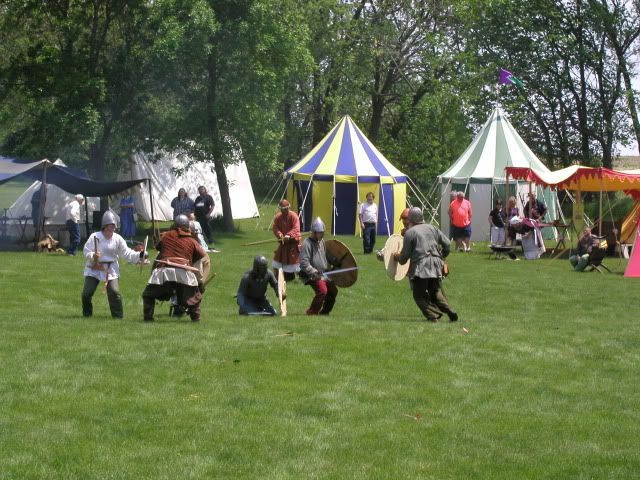 Some guys were out there, sparring or practicing with axes and archery and stuff, then all of a sudden they had organized a battle. I expect they assumed anybody who wanted to participate would just armor up and join in, but I couldn’t work up the confidence. On the other hand, I sold a lot of books that day. The sales were really quite good. Among the buyers was the guy who’d been on my case. I suspected then, and still suspect, that I’ll regret that transaction in time. This was so bizarre under the circumstances, I’m still trying to make any sense at all out of it. I left a little after 4:00 p.m. It was a long, hard drive, better than five hours. Monday I put my American flag out and took it in again, and basically did nothing else but nap and read. Pretty interesting. So several of you slept on the ground in tents with your stuff around you? I think that’s what the Civil War reenactors told us they had done when we talked to them a few months ago. That’s what reenactors generally do. I’m kind of a second-rater in not doing much of that. An archer? How do they make the arrows safe? The arrows used in these combats have very large flights (feathers), which slow the arrow. Instead of an arrowhead, these arrows have large rubber bumpers on the business ends. Also, only low-poundage bows are used.